With its radiant cluster of 3 flirty red Gerberas interspersed with Spear grass this little posy smoulders red, hot and teasing, to give your special someone a little indication of your attraction and affection.Vase not included however; to add to the element of surprise, zFlowers.com recommends including a Standard Vase with your order. 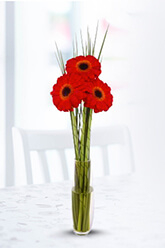 Flowers are beautiful and well priced but I received no confirmation email and the order status wasn’t helpful. Prompt service and a very happy recipient! Ordered flowers no hassle at all extremely happy!!! Thank you heaps ? ?